By: Charlotte Renfield-Miller. This blog post was originally published by IREX. Since the coup in 2012, Mali has been plagued by corruption, which has hindered the government’s ability to combat terrorism. Mandela Washington Fellow Kondo Moussa is having none of it—and he’s fighting back against corruption by turning honest leaders into rock stars with Integrity Idol. Mali established a constitutional government in early 2014, but the country faces difficulty in uniting its factions and establishing peace. The government is led by a small political elite driven primarily by self-interest. For example, President Ibrahim Boubacar Keïta was accused of corruption during his tenure as prime minister, and he has received renewed criticism for appointing his family members to key political posts. As part of the Mandela Washington Fellowship, IREX placed Moussa in a hands-on learning opportunity with the Accountability Lab Liberia. The lab focuses on training young journalists and cultivating a culture of accountability within the media space. Moussa thrived at the Lab and decided to expand its work to his home country of Mali. He has found that the lab’s approach of focusing on the solutions to corruption, not the problems, is more effective than typical approaches in Mali. For example, instead of producing long, dry reports that catalogue how much money has been stolen by the government, Accountability Lab educates young people about their rights and empowers them to become active citizens. Moussa believes that this positive, proactive approach to combatting corruption is the best way forward. After returning home from Liberia, Moussa held Mali’s first Integrity Idol campaign, which celebrates and honors honest government officials across the country. According to Moussa, by holding this competition, “we create a national conversation about corruption, and show the importance of honesty, integrity, and personal responsibility in public affairs.” Integrity Idol echoes the Mo Ibrahim Prize for Achievement in African Leadership, which recognizes African executive leaders who champion democracy. The intention of the Mo Ibrahim Prize is not only to honor its winners, but also to generate conversation around leadership. With Integrity Idol, Moussa hopes to build a similar national conversation around how to lead with honesty and integrity, and he has already been successful in garnering national media attention. A local news program covered the Integrity Idol press conference at which Moussa (along with his partners, such as the Canadian Embassy to Mali) honored the five civil servants who had won the inaugural Integrity Idol. Moussa is not only looking to current leadership, however. He is also cultivating a cadre of youth champions for transparency and accountability. 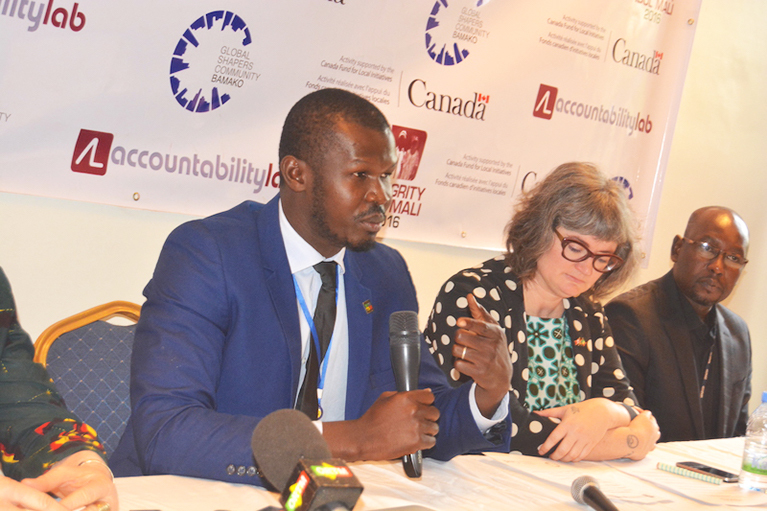 He is currently setting up the Accountability Incubator in Mali, which is the Accountability Lab’s flagship program for young civil society leaders to build sustainable and effective tools for fostering accountability, participation, and social impact. The Mandela Washington Fellowship for Young African Leaders is a program of the US government and is supported in its implementation by IREX. For more information on the Young African Leaders Initiative (YALI), please visit mandelawashingtonfellowship.state.gov.